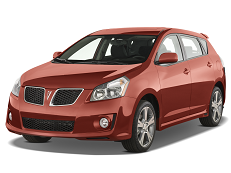 Correct Wheel Sizes, PCD, Offset, Rims and Tire specs for Pontiac Vibe series. Our 2009 Vibe awd has 215x45x17 tires from factory with 5 x 114.3 lug pattern. My 2009 Vibe AWD has 5 x 114.3mm bolt pattern. Tire size 205/55 R16. Pretty sure no vibe ever came with 15" rims. Base/Stock was 16" with 205-55R16 tires optional size was either 17" or 18"- pretty sure it was 17. Will a 5 bolt rim from a Elantra 16" fit a 2008 Vibe. Thank you. Hi,Bill Preston,No,it can’t fit for your vibe.As the PCD are different. I agree with Rob, I have a 2003 Vibe and a 98 Ford Ranger and thought I could use the Ranger mags but they do not fit. On another note, some people commenting here are confusing tire sizes with rim and bolt pattern size, LOL. A tire size may fit any car clearance given of course, the rims bolt pattern will not. Will the tires 225/60r/16 fit on a pontiac vibe 2004 ? Hi, samuel bouchard-couture,no,it can not fit for .Try195/60/16. Hi,samuel bouchard-couture,It is OK.I just texted it by tire calculator. HI, will Honda Accord 5 lug wheels with 205/55R16 snow tires fit my 2005 Vibe? Hi would rims from a 2013 hyundia elantra gt with 215 45r17 fit my 2.4l pontiac vibe with the same size tire? Hi! Can I use 235/40-18 on my Vibe GT 2009? Thanks in advance! I'm looking for a spare set of wheels for a 2008 Vibe on which to install snow tires. Must be the same size as original or the tire place won't install them. What other vehicles use the same size? Vibes and Matrixes are few and far between in the local remove-it-yourself yards. Preferably a late enough vehicle that it will already have the TPMS sensors. Looking to fit 2004 Toyota alloy wheels on my 2005 Pontiac Vibe (fitted with steel wheels). What wheel lugs do I need to use ? Hi,Harry Jones,The wheel lugs you need to use is 5*100,offset is 45. Will rims that fit a 2010 Pontiac Vibe fit a 2005 Pontiac Vibe? 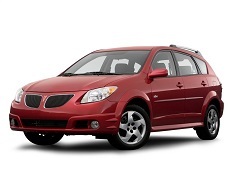 2004 Pontiac Vibe GT with 215 50 17 stock on car, may I use 215 60 17 snow tires on the stock rims? Hi,Curtis,No,these two tires are not compatible. Hi! I was wondering if I can use 245/40-18 or 255/40-18 tires on my Vibe GT 2009? What is the widest size for the oem rims? Thank you in advance! Hi,Stan,The stock tires for your car is 225/40/18,So 245/40/18 is compatible but 255/40/18 is not.